In line with the expression and function of TLRs in the female genital tract, it has been demonstrated that the human placenta contributes to maternal immune responses against various pathogenic agents through expressing different TLRs and producing pro-inflammatory mediators., Conventionally, the placenta comprised the amnion, chorion, and decidua. The amnion, which is the closest layer to the fetus and derived from the embryo, consists of both cubical and columnar epithelial cells. Human amniotic epithelial cells (hAECs) have stem cell-like and immunomodulatory features which play an important role in the maintenance and outcome of pregnancy. Previous reports indicated that hAECs can produce the immunosuppressive compounds such as TGF-β, prostaglandin E2 (PGE2), and IL-4., On the other hand, others have shown that the expression of functional TLRs on hAECs makes these cells as a physical barrier to protect the developing fetus against intra-amniotic infections through upregulating the production of antimicrobial β-defensins and key pro-inflammatory cytokines involved in PROM and PTB.,, Therefore, thought that hAECs may exert various functions under different conditions. Although TLRs' expression in the urogenital tract and their role in pregnancy loss are well known, there are a few reports that show the function of TLRs and molecular mechanisms involved in the possible effects of these receptors of the innate immune on hAECs in pregnancy complications. In this study, we investigated whether activation of TLR4, as a known TLR of hAECs, on LPS engagement in hAECs can be a potential threat to the successful pregnancy through influencing the production of IL-1 beta (IL-1β), IL-6, IL-5, tumor necrosis factor-alpha (TNF-α), PGE2, and TGF-β1 mediators of hAECs. This is a cohort study performed on six healthy pregnant women. The nonrandom sampling was used to select the participants. The study was conducted from September 2016 to March 2017 in Isfahan University of Medical Sciences, Isfahan, Iran. All protocols and experiments used in this study were approved by the Ethics Committee of Isfahan University of Medical Sciences (protocol number: 394205) that was in accordance with the Declaration of Helsinki for medical research involving human subjects. The sample size was determined by a statistician using statistical tests according to the similar studies in the literature. The amnion (n = 6) was retrieved from the full-term placentas delivered by normal pregnant women during uncomplicated elective cesarean deliveries before the onset of labor. The hAECs were isolated according to the method previously described by Motedayyen et al. Briefly, the amniotic membrane was mechanically peeled off from the chorion and cut into small pieces. The amnion layer was then washed several times with phosphate-buffered saline (PBS, pH 7.2) and incubated at 37°C for 10 min with predigestion buffer (calcium and magnesium-free Hank's balanced salt solution (HBSS) containing 0.53 mM ethylenediaminetetraacetic acid [EDTA]-4Na) to remove blood clots, torn pieces, and cellular debris. The digestion of the amnion was initiated at 37°C for 10 min with 0.05% EDTA/trypsin (Gibco, USA). Afterward, the amnion was digested twice at 37°C for 30 min with 0.05% EDTA/trypsin. The cells isolated from the amnion at the second and third digests were pooled and washed with ice-cold HBSS (Gibco, USA). Cell counts were performed using a Burker Neubauer chamber (hemocytometer, 40443001, Hecht Assistent, Germany). The viability of the cells was determined by trypan blue dye exclusion. The purity of the cells was measured after the fixation and permeabilization of the cells using an Intracellular Fixation and Permeabilization Buffer Set (eBiosciences, USA). To determine the cell purity, cytokeratin as an intracellular epithelial marker was stained with Alexa Fluor® 488 anti-cytokeratin or matched isotype control antibodies for 30 min at 4°C [Table 1]. The matched isotype control antibody was considered as negative control. The cells were then washed several times with cell staining buffer (BioLegend, USA) and centrifuged at 200 × g for 5 min at 4°C. The data were acquired using a FACSCalibur system (Becton Dickinson, San Jose, CA, USA) and then analyzed using FlowJo software (v 10.1, FlowJo, Ashland, OR, USA). The cells with the purity more than 96% were used as hAECs. To analyze the phenotypic characteristics of freshly isolated hAECs, the cells were stained by different primary or relevant isotype control antibodies. The hAECs (8–10 × 105) were suspended in 100 μl PBS/1% bovine serum albumin and incubated with different antibodies or matched to isotype control immunoglobulin G for 30 min at 4°C [Table 1]. The cells were then washed three times with cell staining buffer, and the percentage of the stained cells was determined by a FACSCalibur flow cytometer and analyzed using FlowJo software. The isolated hAECs (9–10 × 107) were suspended in 50 ml Dulbecco's modified Eagle's medium/Nutrient Mixture F-12 (Gibco, USA) supplemented with 10% fetal bovine serum (Gibco, USA) and 1% penicillin/streptomycin (Sigma-Aldrich, USA), and then cultured in 75-cm2 tissue culture flasks at a density of 3 × 105 cells/cm2. After 24-h incubation at 37°C with 5% CO2, adhered hAECs were dissociated by trypsin and washed twice with PBS. The cells were counted by a hemocytometer and cell viability was determined using trypan blue dye exclusion. To determine the effect of TLR4 stimulation by LPS on production of some mediators of hAECs, the detached cells (4 × 105 cells/ml) were seeded in 24-well plates (Biofil, Canada) and incubated in the presence or absence of LPS (5 μg/ml, Sigma-Aldrich, USA) at 37°C with 5% CO2. The hAECs stimulated with LPS served as test group, while the cells cultured in the absence of LPS were considered as control group. All cultures were performed in duplicate. To measure the possible effect of LPS-stimulated TLR4 on production of pro- and anti-inflammatory mediators of hAECs, the culture supernatants of hAECs in test and control groups were collected after 24, 48, and 72 h. The levels of IL-1β, IL-6, TNF-α, IL-5, TGF-β1, and PGE2 were measured by an enzyme-linked immunoasorbent assay kit according to the manufacturer's protocol (Mabtech, Sweden). The results are expressed as mean ± standard error of the mean. Statistical analyses were done using GraphPad Prism 6 (GraphPad software, San Diego, CA, USA). In the present study, comparison was preformed between the test group and control group. Unpaired t-test was used to compare the two groups with normal distribution, while Mann–Whitney test was performed in the case of nonnormal distribution. P < 0.05 was considered statistically significant. Given that hAECs are not a cell line and do not have a defined immunological profile, we examined the expression of some known markers of these cells isolated from five distinct amnion donors. Flow cytometry results revealed that hAECs were strongly positive for the expression of cytokeratin (an epithelial marker) and stage-specific embryonic antigen-4 (an embryonic stem cell marker) [Figure 1]. 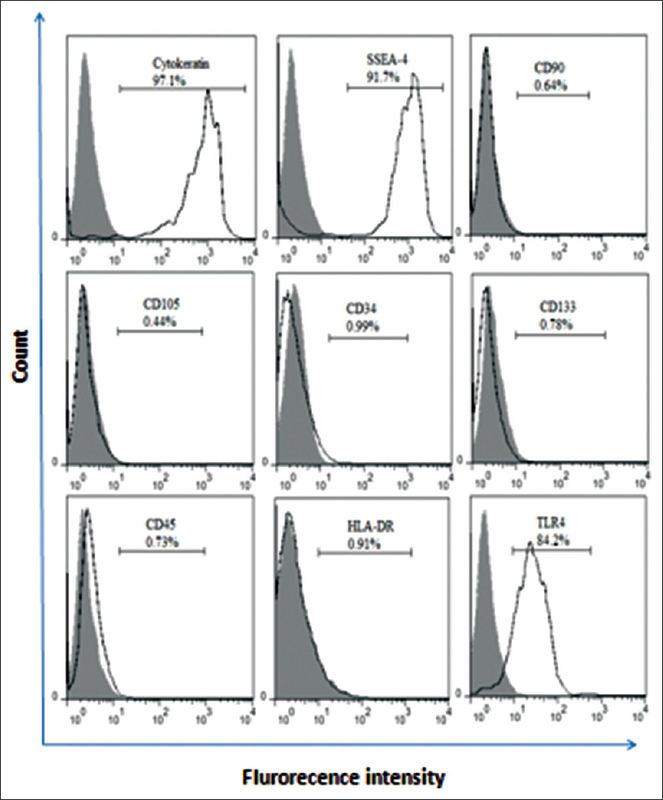 hAEcs failed to express CD90 and CD105 (mesenchymal stem cell markers) and some of hematopoietic stem cell markers including CD34, CD133, and CD45 [Figure 1]. Furthermore, our data indicated that hAECs were negative for human leukocyte antigen-DR (HLA-DR), in which its expression on the cell surface increases the risk of immune responses against the cells [Figure 1]. Nearly all hAECs expressed high level of TLR4, a well-known receptor for recognizing LPS [Figure 1]. Regarding the fact that anti-inflammatory mediators have an indispensable role in the maintenance and outcome of pregnancy, the effects of LPS-stimulated TLR4 on TGF-β1, PGE2, and IL-5 production of hAECs were assessed. Our data demonstrated that TLR4 activation by LPS affected the production of TGF-β1 of hAECs. After 48 and 72 h of incubation, TGF-β1 production of LPS-treated hAECs was significantly higher than TGF-β1 produced by untreated hAECs (P < 0.001–0.05) [Figure 2]a. The mean production of TGF-β1 of stimulated and nonstimulated hAECs after 24, 48, and 72 h is shown in [Table 2]. Moreover, we observed that TLR4 activation significantly increased PGE2 production of hAECs after 24 and 48 h of culture (P < 0.01–0.05) [Figure 2]b and [Table 2]. In spite of measurement and assessment of the effects of TLR4 activation on TGF-β1 and PGE2 production of hAECs, we could not determine the effects of TLR4 stimulation by LPS on the IL-5 production of hAECs. Our results indicated that the IL-5 level in culture supernatants of hAECs was below the detection limit, and the IL-5 production did not influence by LPS stimulation. The IL-5 level was only detectable in hAEC samples No. 3 and 5 (data not shown). Having considered that inflammatory responses are harmful to the successful pregnancy, we examined the effects of TLR4 stimulation on the production of pro-inflammatory cytokines, including IL-1β, IL-6, and TNF-α of hAECs. 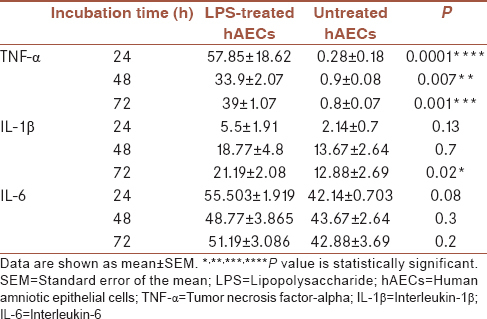 As shown in [Figure 3]a, there was a significant increase in the production of TNF-α of LPS-stimulated hAECs after 24, 48, and 72 h of incubation (P < 0.0001–0.01) [Figure 3]a and [Table 3]. The same trend was also observed in the IL-1β production of LPS-treated hAECs [Figure 3]b. TLR4 activation had a potent effect on IL-1β secretion of hAECs (P < 0.01) [Figure 3]b. After 72 h of culture, the mean production of IL-1β of stimulated and nonstimulated hAECs was 21.19 ± 2.08 and 12.88 ± 2.69, respectively [Table 3]. Our results indicated that TLR4 activation could induce IL-6 production of hAECs, although this induction was not statistically significant [Figure 3]c and [Table 3]. Maternal immune responses to the fetus is a major challenge for the implantation and maintenance of pregnancy. In normal pregnancy, maternal–fetal tolerance plays a fundamental role in suppressing abnormal immune responses and inhabiting immunological rejection of the fetus. However, intrauterine infection is a well-known risk factor for disrupting feto–maternal immunologic tolerance, leading to PROM, PTB, and recurrent abortion., Therefore, we investigated whether TLR4 activation by LPS on hAECs may contribute to abnormalities in maternal immune responses at the feto–maternal interface through affecting the production of anti- and pro-inflammatory mediators of hAECs. Although numerous reports have revealed TLR expression and its function in the female genital tract, a few studies have been carried out on the TLR repertoire and its role in hAEC responses to intra-amniotic pathogens.,, Some studies conducted on TLR expression and its response on TLR ligand engagement in hAECs have demonstrated that TLR activation has different results on functions of hAECs, depending on which TLR is activated. Furthermore, immunosuppressive impacts of hAECs are mainly mediated through the secretion of immunomodulatory components. Therefore, an important question proposed in this study was how TLR4 activation by bacterial components can be affected immunosuppressive impacts of hAECs. At the first step, the effects of TLR4 activation on TGF-β1 production of hAECs were studied. We observed that TLR4 stimulation had a potent effect on TGF-β1 production of hAECs after 48 and 72 h of culture. In consistent with this result, our previous study also showed that the TGF-β1 expression in hAECs could be significantly induced by TLR4 activation. To discover the effects of LPS-stimulated TLR4 on PGE2 production of hAECs, our findings showed that the PGE2 levels in culture supernatants of hAECs cultured in the presence of LPS were significantly higher than those of hAECs cultured alone. Given that TGF-β1 and PGE2 are two anti-inflammatory agents, production of these mediators of hAECs suggests that they may participate in suppressing immune responses against intra-amniotic infections and enhancing maternal immunological tolerance to the fetus; however, several lines of evidence indicate that TGF-β1 has a pivotal role in cell-mediated immunity through increasing activation, proliferation, and differentiation of T cells.,, Moreover, previous reports have provided convincing evidence that PGs enhance MMP activation, programmed cell death (apoptosis), and stimulate uterine contractions. Therefore, it is likely that TLR4 stimulation on LPS engagement on hAECs induces T cell-mediated cellular immune responses against intra-amniotic bacteria and participates in the weakening and the rupture of the fetal membranes through TGF-β1 and PGE2 production. However, the critical question that must be addressed in future studies is how the molecular mechanisms involved in the effects of TLR4 stimulation on the TGF-β1 and PGE2 secretion of hAECs. Regarding the fact that intrauterine pathogens cause deleterious responses at the feto–maternal interface and thereby lead to the breakdown of maternal immunological tolerance to the fetus, the possible role of hAECs in enhancing harmful responses to the successful pregnancy was evaluated. We focused on determining how TLR4 activation by LPS disrupts pregnancy-friendly immunity at the feto–maternal interface. In the current study, we observed that in the presence of LPS, the TNF-α production of hAECs was significantly increased, which is consistent with the results of a study conducted by Li et al. that showed hAECs express TNF-α. Regarding the fact that TNF-α acts as a trigger in the induction of apoptosis, production of this pro-inflammatory agent of hAECs may be a potential risk factor for the reduced survival of hAECs and the rupture of the fetal membranes. In the next step, to determine the role of TLR4 activation on stimulating production of other cytokines related to pregnancy complications, the effects of LPS on IL-1β and IL-6 secretion of hAECs were assessed. The results of this study demonstrated that hAECs significantly produced IL-1β when the cells were cultured in the presence of LPS, while IL-6 production did not influence by LPS. In contrast with our results, Gillaux et al. indicated that TLR5 and TLR6/2 stimulation on hAECs induced pro-inflammatory cytokines such as IL-6 and IL-8; however, hAECs stimulation by LPS could not influence the production of these cytokines of hAECs. The authors reported that TLR4 stimulation by LPS only led to the decreased viability of cells and increased rate of cell apoptosis. Moreover, it has been shown that intra-amniotic bacteria such as Ureaplasma parvum and U. urealyticum serovars increased IL-1β, IL-6, IL-8, and TNF-α production of hAECs through the stimulation of TLR2, TLR6, and TLR9. Therefore, the results of this study provided evidence that shows TLR4 stimulation along with other TLRs may contribute to production of pro-inflammatory cytokines of hAECs. In line with this notion, it is thought that the activation of various TLRs on hAECs along with other infiltrating immune cells and endogenous cells in the female genital tract plays a fundamental role in the pathogenesis of spontaneous abortion, PROM, and PTB. Taken together, our data provide evidence to indicate that TLR4 stimulation by LPS on hAECs participates in maternal immunological abnormalities at the feto–maternal interface through inducing TNF-α, IL-1β, PGE2, and TGF-β1 production of hAECs. These findings suggest that TLR4 activation may be a potential risk factor for pregnancy failures. However, more robust studies and more information are required to clarify the causative role of TLRs of hAECs in pregnancy loss. The authors would like to thank Baqiyatallah University of Medical Sciences and the Deputy of Clinical Development Medical Center of Baqiyatallah Hospital for their helps and financial supports of Isfahan University of Medical Sciences (Grant No: 394205). This work was financially supported by grants from the Isfahan University of Medical Sciences (Grant No: 394205). Arenas-Hernandez M, Romero R, St. Louis D, Hassan SS, Kaye EB, Gomez-Lopez N, et al. An imbalance between innate and adaptive immune cells at the maternal-fetal interface occurs prior to endotoxin-induced preterm birth. Cell Mol Immunol 2016;13:462-73. Wegmann TG, Lin H, Guilbert L, Mosmann TR. Bidirectional cytokine interactions in the maternal-fetal relationship: Is successful pregnancy a TH2 phenomenon? Immunol Today 1993;14:353-6. Piccinni MP. T cell tolerance towards the fetal allograft. J Reprod Immunol 2010;85:71-5. Sacks G, Sargent I, Redman C. An innate view of human pregnancy. Immunol Today 1999;20:114-8. Mor G, Cardenas I. The immune system in pregnancy: A unique complexity. Am J Reprod Immunol 2010;63:425-33. Gillaux C, Méhats C, Vaiman D, Cabrol D, Breuiller-Fouché M. Functional screening of TLRs in human amniotic epithelial cells. J Immunol 2011;187:2766-74. Fortunato SJ, Menon R, Bryant C, Lombardi SJ. Programmed cell death (apoptosis) as a possible pathway to metalloproteinase activation and fetal membrane degradation in premature rupture of membranes. Am J Obstet Gynecol 2000;182:1468-76. Konecny FA. Review of cellular and molecular pathways linking thrombosis and innate immune system during sepsis. J Res Med Sci 2010;15:348-58. Reynolds JM, Dong C. Toll-like receptor regulation of effector T lymphocyte function. Trends Immunol 2013;34:511-9. Taheri RA, Motedayyen H, Ghotloo S, Masjedi M, Mosaffa N, Mirshafiey A, et al. The effect of lipopolysaccharide on the expression level of immunomodulatory and immunostimulatory factors of human amniotic epithelial cells. BMC Res Notes 2018;11:343. Motedayyen H, Ghotloo S, Saffari M, Sattari M, Amid R. Evaluation of microRNA-146a and its targets in gingival tissues of patients with chronic periodontitis. J Periodontol 2015;86:1380-5. Patni S, Wynen LP, Seager AL, Morgan G, White JO, Thornton CA, et al. Expression and activity of toll-like receptors 1-9 in the human term placenta and changes associated with labor at term. Biol Reprod 2009;80:243-8. Motedayyen H, Esmaeil N, Tajik N, Khadem F, Ghotloo S, Khani B, et al. Method and key points for isolation of human amniotic epithelial cells with high yield, viability and purity. BMC Res Notes 2017;10:552. Ueta M, Kweon MN, Sano Y, Sotozono C, Yamada J, Koizumi N, et al. Immunosuppressive properties of human amniotic membrane for mixed lymphocyte reaction. Clin Exp Immunol 2002;129:464-70. Motedayyen H, Rezaei A, Zarnani AH, Tajik N. Human amniotic epithelial cells inhibit activation and pro-inflammatory cytokines production of naive CD4+T cells from women with unexplained recurrent spontaneous abortion. Reprod Biol 2018;18:182-8. Szukiewicz D, Szewczyk G, Pyzlak M, Klimkiewicz J, Maslinska D. Increased production of beta-defensin 3 (hBD-3) by human amniotic epithelial cells (HAEC) after activation of toll-like receptor 4 in chorioamnionitis. Inflamm Res 2008;57 Suppl 1:S67-8. Triantafilou M, De Glanville B, Aboklaish AF, Spiller OB, Kotecha S, Triantafilou K, et al. Synergic activation of toll-like receptor (TLR) 2/6 and 9 in response to Ureaplasma parvum & urealyticum in human amniotic epithelial cells. PLoS One 2013;8:e61199. Al-Achkar W, Wafa A, Ammar S, Moassass F, Jarjour RA. Association of methylenetetrahydrofolate reductase C677T and A1298C gene polymorphisms with recurrent pregnancy loss in syrian women. Reprod Sci 2017;24:1275-9. Aluvihare VR, Kallikourdis M, Betz AG. Regulatory T cells mediate maternal tolerance to the fetus. Nat Immunol 2004;5:266-71. Kanellopoulos-Langevin C, Caucheteux SM, Verbeke P, Ojcius DM. Tolerance of the fetus by the maternal immune system: Role of inflammatory mediators at the feto-maternal interface. Reprod Biol Endocrinol 2003;1:121. Nasu K, Narahara H. Pattern recognition via the toll-like receptor system in the human female genital tract. Mediators Inflamm 2010;2010:976024. Motedayyen H, Zarnani AH, Tajik N, Ghotloo S, Rezaei A. Immunomodulatory effects of human amniotic epithelial cells on naive CD4+T cells from women with unexplained recurrent spontaneous abortion. Placenta 2018;4:120-9. Letterio JJ, Roberts AB. Regulation of immune responses by TGF-beta. Annu Rev Immunol 1998;16:137-61. Gonzalez CR, Matzkin ME, Frungieri MB, Terradas C, Ponzio R, Puigdomenech E, et al. Expression of the TGF-beta1 system in human testicular pathologies. Reprod Biol Endocrinol 2010;8:148. Kehrl JH, Wakefield LM, Roberts AB, Jakowlew S, Alvarez-Mon M, Derynck R, et al. Production of transforming growth factor beta by human T lymphocytes and its potential role in the regulation of T cell growth. J Exp Med 1986;163:1037-50. Li H, Niederkorn JY, Neelam S, Mayhew E, Word RA, McCulley JP, et al. Immunosuppressive factors secreted by human amniotic epithelial cells. Invest Ophthalmol Vis Sci 2005;46:900-7.